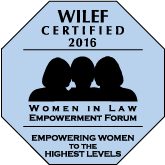 MILWAUKEE, Wis. — The national law firm of Quarles & Brady LLP today announced that it has achieved Gold Standard Re-Certification by the Women in Law Empowerment Forum (WILEF) for the six straight year. Thirty one firms are included on this year’s list. "We are proud to have made this list for the sixth year in a row," said Darlene Austin, director of diversity & employee relations & corporate social responsibility. "Our repeated certification is proof positive that Quarles & Brady is committed to inclusive leadership among all attorneys in our firm; this is part of our culture. We are honored to have been recognized as one of the six firms to have met all of WILEF's criteria." Women account for at least 20 percent of U.S. equity partners or, alternatively, one-third of non-lateral attorneys that became U.S. equity partners within the previous 12 months. Women represent at least 15 percent of firm and U.S. branch office heads combined. Women represent 20 percent or more of the firm's compensation committee. Women represent at least 15 percent of the top half of U.S. equity partners in terms of compensation.